Over the past few months I have been slowly trying to simplify our living space. This has not only been an amazing exercise to help me really think about what we have and why we have it… but it has also reduced the stress and anxiety I feel around our living space and regarding housework. Having less *stuff* in our home means we have more space to live, and it also means I have less *stuff* to take care of, tidy, and/or worry about. Longevity – Is this going to last us for a long enough time to make the purchase worthwhile? Is it going to break or lose pieces too easily? Beauty – Do I like the way this looks enough to keep it for a long time? Is it going to keep it’s form/shape/colour/attractiveness? Ethics and Sustainability – Was this created ethically and using earth-friendly materials? Is there an alternative product? Although I do feel like I have already gotten a lot done (and gotten rid of a lot of stuff! ), I’ll admit that I have been a bit haphazard about how I have gone about the simplification process. For example one day I went through all my lotions and toiletries, and the next day I decided to cull the cutlery drawer. Although it was still useful to simplify things in a carefree manner, I have realised that having a master list of *stuff* I wanted to go through and sort would be ideal. 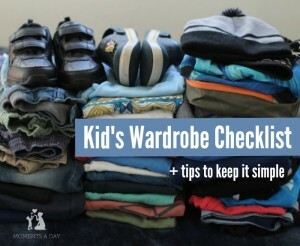 Therefore I have created a checklist to go through our house again more systematically – one “kind of thing” per day, i.e. spices or books in the bedroom. You can find this list – along with a printable version – at the end of the article. I plan to take one item per day for the next 50 days, so that within two months I will have gone through most everything we own and figured out whether or not it is worth keeping. 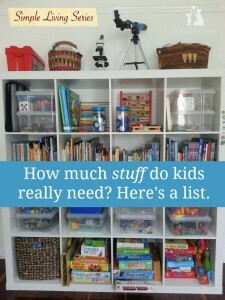 I hope simplifying not only helps me stay more organised, but helps the kids learn that we do not need to keep things “just because.” Letting go and passing things on to those who can use them is more important than filling one’s house with objects that have no true purpose being there. 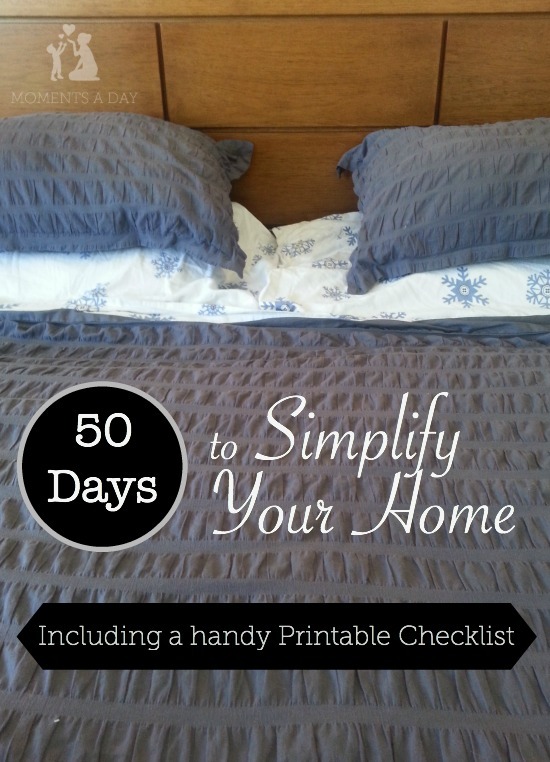 Want to join in on 50 Days to Simplify? Since I began the simplification process, I have identified several recurrent thoughts that may be helpful for someone else to consider if they are just starting to simplify. Deciding what to keep and what to give (or throw) away is not always an easy task, after all! 1. A lot of *stuff* has “sentimental value,” but that does not mean you have to keep it. 2. Sometimes we hang on to things mostly because we paid money for them, not because we are actually using them. Not quite sure what I mean? Here’s an example. Soon after I got married I bought a tablecloth and set of cloth napkins that matched our house at the time. It actually wasn’t that expensive but, considering we were really counting pennies at the time, I felt attached to the investment I had made in these items. Since then, the colours never suited our living area so we haven’t used them. But three moves later, I was still hanging on to them. I finally admitted to myself that I just wasn’t going to use these items any more… why not pass them on to someone who will actually use them? Now that they are gone, I really don’t even miss them. But I do love having the extra space in my cabinet. 4. We can learn to share and borrow. 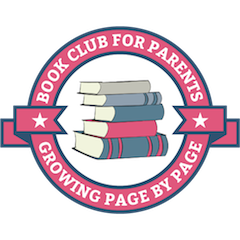 It’s lovely to have a collection of gorgeous children’s books. But there is also something called a library. We do not need to go out and buy every book we love, even if they are “on sale.” Finding enjoyment in the experience of using something versus the idea of owning something is a great practice to deepen gratitude and detachment. Same goes for games, toys, even baby gear. Imagine if we all shared… so much better for our budgets as well as the earth. 5. Less is – a lot of times – more. I am very fond of framed photographs and artwork, and my husband and I have collected various pieces over the years from different countries and as gifts. Decluttering our walls however has brought a sense of relief and an openness to our home that we never had before. Though I still love some of the paintings we have given away, and I know that I cannot immediately see as many family pictures as I could before, I feel that having simpler walls is really more conducive to orderliness in our home. Ornaments and decorations are much more treasured when there are fewer, anyway. What do you think? Are there areas of your home you would like to simplify? Do you find yourself falling into any of these thought patterns? Here is my printable checklist of items to simplify written out. You can download it by clicking here. Download this list as a PDF you can print out by clicking here. What advice do you have about simplification? Are you ready to start? I must first say…Yes, yes, yes! When we moved to Japan, we were on a severe weight restriction from the military. We purged and purged, and when we got here, I still felt like we have way too much! I do not hold much emotional attachment to material items, so I don’t have a hard time donating or tossing stuff away. The terrible thing is we somehow manage to acquire more and more stuff. I love your list of things to consider before buying something. I’m going to print that off and put it on our fridge and ask my husband (and myself) to commit to reading the list before buying something. With all this stuff, it just seems like such a pile of waste in our home. Why do we have all these *things* when others have so little? Thanks Chels for an inspiring post. Reading your article made me think of 2 videos that really helped me simplify my life / house / perspective. I love this list, Chelsea! Here is one of my big challenges when it comes to decluttering: my children’s artwork. They are so sweet when they give me their drawings, many of them are depictions of us together. Over the years our dining room has become lined with their art. But I know the room and our home would be much less visually distracting if the walls were clear … I just haven’t been able to bring myself to take the artwork down. I don’t want to hurt my kids’ feelings either. What can I say? I have a soft spot in my heart for it. But I’m open to your a thoughts on the matter! Oh Juliet it’s hard, I totally understand! Right now we have a system that works for us… we have ONE wall that is the “art wall” where new favourite pieces go (you have to remove one from the wall to make space for a new one). Seems a bit harsh, but they are happy with it. After things are taken down, we keep EVERYTHING (that the boys care to keep, that is – sometimes they are happy to throw away pieces that weren’t favourites) and it all gets stored beneath my younger son’s bed because he has a large storage drawer there. When that gets full – after a few months usually – we go through it and weed things out, taking photos of 3D pieces or paintings bigger than A4 size, choosing favourites, and recycle the rest. After about a year, I go through everything that has been kept (these are in their “memorabilia boxes” which are underbed storage containers (each boy has one) and put it into a scrapbook also kept in that box… really there are only a few pieces I keep per year. The only way I become so brutal is to remember how I had to personally go through all my stuff as a teenager and get rid of stuff… and I realised that really only a few things were necessary. The boys don’t care at that point what I give away (I try to do it non discretely) as it’s been so long since they’ve even seen it. But then again, my kids are young and haven’t done a ton of amazingly keepable pieces… so our “system” will probably evolve as they get older. I do try to take photos to keep the most important pieces – posting ones on Facebook which have a story so I know where to find them in the future. Whoa that was long. Anyway just a few ideas 🙂 Good luck! Take a digital picture of those cherished art pieces. Load them into a digital picture frame, and program it to slideshow. Take pictures of artwork and create a photo book with them. I bought a memories box and I store my favorite art from my son. I also had one for my daughter who is an adult now and she loves looking at the artwork.I also put things like awards and report cards in the box. There is a phone app called Keepy. You can take pics, or videos, add descriptions…date, location, etc. They can be uploaded st a later date to Shutter fly or other Web app to create a photo book. I’ve started this at an early age with my child’s art projects…works well. Love the challenge of a certain number of bags to give away! I totally agree you have to simplify over and over… I hope to get to the point one day where we bring in less stuff, but it’s definitely a process! I really need to set aside some time to tackle this… thanks so much for the inspiration! I definitely need to simplify things, I’m feeling very overwhelmed at the moment. Thanks for this checklist. I must admit I really need to do this. i recently did my twins bedrooms and clothes and it felt so good. So many other areas need doing and it really does make you think about things a bit more! Love your list and your printable, thanks for sharing! Oh, I love a good clean out!! Now spring has arrived this is really helpful to get started. As a list person, it’s brilliant. On one page – (less paper). I start where I want – (cross off in any order), and I make a positive ‘contract to myself’, re: future shopping… Visually – a great addition to my vision board. Over here in UK, I would also add that some homes have, an attic/loft(room in roof – not a loft room) and basement. How about; the garden, shed and garage? We just moved into a new home and stuff I loved for the old house I just don’t love as much for this one. Definitely time to do a room by room simplify! Thank you for this inspiration and for the great printable! Hope you have a great week! Oh goodness sentimental items are so hard! I admit I haven’t gotten to that stage in life. My mother has so many sentimental items, I’m not sure what I will do when I inherit them! When I’m shopping, I ask myself if what I am about to buy worth the time to dust, clean, straighten or put it away over and over again… I usually end up putting it back. Hi Chelsea, thanks for the useful article. As a recovering collector, I recently started delving into the decluttering movement. I’m committed to give or throw away one item a day for an entire year. I’ve created a blog to hold myself accountable (declutterme.tumblr.com), and I’m almost looking forward to getting rid of something every day. I think that focusing on the fact that someone else will be able to use your products more than you is helpful. This resonates with me as I was just saying to my husband last night we have too much ‘stuff’ and really I wouldn’t be any less happy if lots of it was gone. I am planning a two week thin out and probably head to a car boot sale then charity shop for the rest. This is such a great checklist! Between running my own little business and doing the housework I can really feel the excess of stuff in the house, but I never have the time. I think it’s time for a throughout reassessment of everything at home! Thank you! H! Im so glad I found you Web page! I was married for 38 years and six years ago we separated and continue to live separate lives. Can you help a 60+ woman to live simply? I have no one who even wants my “things” that went with my former home/life. Hi Cathy, it sure is a journey and you have so much more experience than me! I am currently writing an ecourse to share the lessons we have learned to live a clutter free life (a lot since writing this particular post) so if you are interested, be sure to sign up for my newsletter so you’ll get word when it’s available. I loved this article. I used to have collections of things and my house was more like a hotel, restaurant and store. I found a job in another city and we had to move to a little apartment which is as big as my living room and dining room together back in the house. I was so disappointed for giving up my stuff. But after three months living with almost nothing in the apartment I realized that I didn’t miss my things in the house. I donated or sold most of them and today I live much happier with less things. As you said, now I think three times before buying anyhting, we are using more public services like libraries and I have more money to travel which I love. Books and records I used to have printed are now stored in my computer. Less is more now. It helps to get rid of stuff you don’t need if you have a cause. For the last 10 years we have had 2 yard or garage sales a year. A very small thing I have done in getting rid of stuff is that I have taken my collection of old handbags and filled them with samples I have received of lotions, shampoos, eats. Along with extra socks, gloves, scarves, and other items that I need to discard. Then I go to the community shelter near meal time and give them away as I begin to see women approach. Just a thought I wanted to share. Love that idea, thanks for sharing! I love this article. Is this the list of things to keep? It’s the things to go through each day to decide what to keep. I completely agree with you in regards to the fact that we keep “stuff” because of the monetary value we place on them, or how much we spent on them. At times we find that we don’t truly love the item, or it does not add true value or worth to our life, but again when we think about the financial amount we spent on the item, we create a mental roadblock which in essence precludes us from wanting to let go. Almost as if we allow our minds to hinder us from letting go.